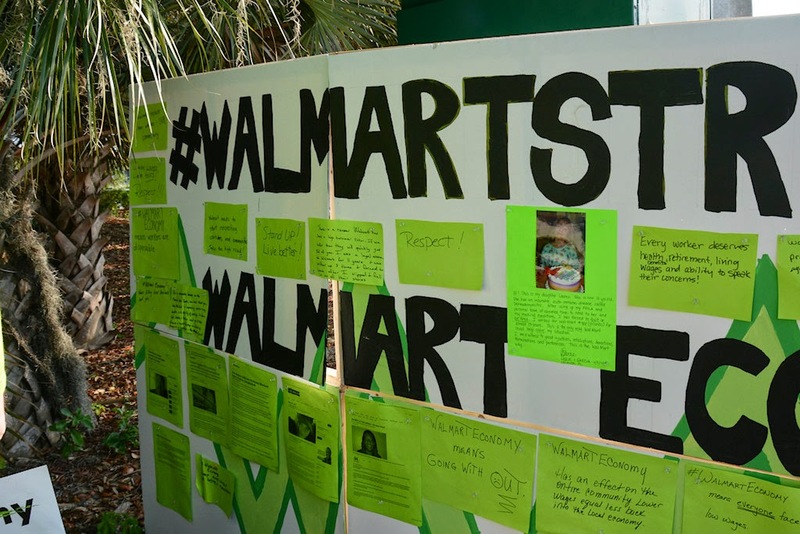 On Wednesday, June 4, there were several protests staged at Walmart's across the country, including one in Tampa, on East Fletcher Avenue. EyeOnTampaBay was there. We estimate that about 30 or so people were protesting. Some said they were from Walmart, and some appeared they were from labor organizer or activist groups. Others just looked like they like a good protest. We were not able to determine which organization if any was in charge. 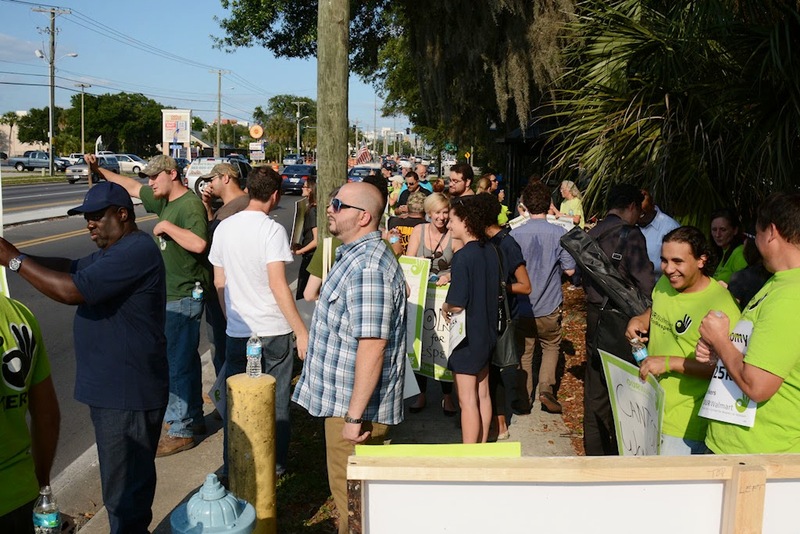 One woman did much of the speaking, and she'd already come from protests earlier in the day in Merritt Island and Orlando before arriving in Tampa. She spoke of pregnant women's rights, created a group called "Respect the Bump", which helped Walmart recognize that pregnancy is a medical condition. She also spoke about "a wall" Walmart strikers have created to document their stories and complaints, and what the "Walmart economy" means to them, as well as the larger community. Another speaker was a (former?) Walmart employee and striker, although we could not hear him well. "Here's the deal. Workers, everything that you have you must take." "The fact is, we have the capacity to not only raise wages, but reduce work hours worldwide." "I believe you have to fight for every inch...OK, I ran out of ideas. Thanks." Also, they announced Chuck did not make it, and could not be found, but he's supposed to go on strike tonight. We also saw a protester we could have sworn we saw and talked to at the Greenlight Pinellas Rally in Largo, FL on May 27, carrying a different sign this time. They do get around. The IWW promotes the concept of "One Big Union", contends that all workers should be united as a social class and that capitalism and wage labor should be abolished. They are known for the Wobbly Shop model of workplace democracy, in which workers elect their managers and other forms of grassroots democracy (self-management) are implemented. 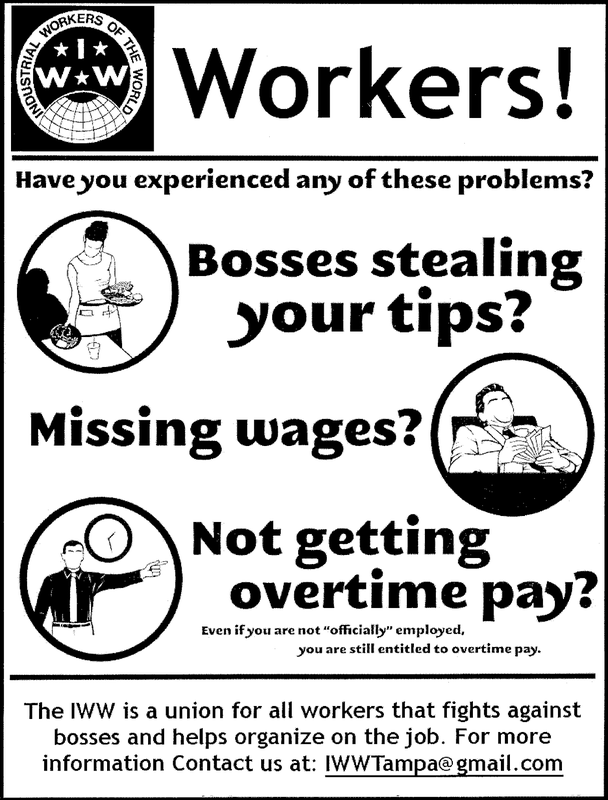 IWW membership does not require that one work in a represented workplace, nor does it exclude membership in another labor union. If everyone gets to vote on everything, I bet they'll need a lot of meetings. Not sure that'll make a great place to work. Several cars, and at least one Walmart truck driver, honked their horns in support while we were there. Take a look at the video above and see the Walmart protest for yourself.